The first jail on Broad Street was on the eastern edge of the Old Burying Ground. A new jail was built as a three-story stone structure with cells in the cellar in 1810 at the corner of Broad & Walnut Streets, the site of the Grace Episcopal Church (jail burned in 1835). For the detention of persons awaiting trial, of those detained as witnesses, and of those sentenced by the court. This last includes those sentenced for short terms and in whose sentence is not specifically included the condition "at hard labor." 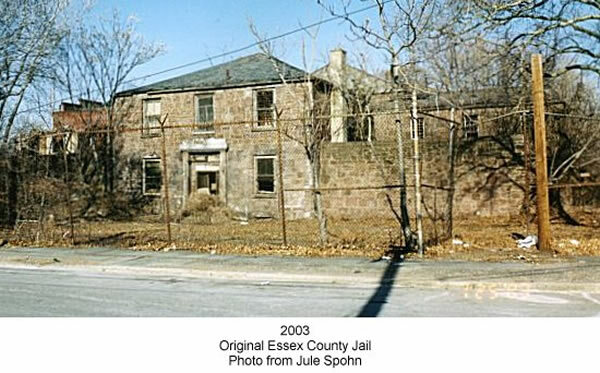 The latter are sent to the Essex County Penitentiary. In the County Jail are held United States prisoners awaiting trial, the county receiving compensation from the United States Government. No labor is required of prisoners. Under the supervision of the Sheriff and the Essex County Board of Chose Freeholders. Jail also used in lieu of a psychopathic ward for cases of dipsomania.